On Friday, October 21, 2016, Bishop Anne Henning-Byfield, Bishop of the 16th Episcopal District of the African Methodist Episcopal (AME) Church, visited the United Theological College of the West Indies (UTCWI). During her visit to the campus, she worshipped with the community during the midday worship service. She greeted all who were in attendance during the worship service. She also met with a small group of female students to discuss being female and clergy. One particular discussion was based upon Bishop Henning-Byfield's recent article, "Who Made Them Leaders?" In addition, Bishop Henning-Byfield met with key leadership of UTCWI and the AME Church to discuss partnerships between UTCWI and the AME Church. She also remarked about the beauty of the mountainous backdrop of the campus. 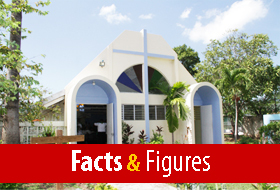 The 16th Episcopal District of the AME Church includes Guyana, Suriname, Virgin Islands, Dominican Republic, Haiti, Jamaica, Cuba, Winward Islands and Brazil. Bishop Henning-Byfield is the 135th elected and consecrated Bishop of the AME Church and only the fourth female Bishop in the two hundred history of the African Methodist Episcopal Church. She will be proudly and passionately be serving the 16th Episcopal District for the next four years. 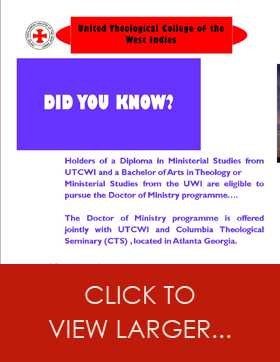 UTCWI was founded in 1966.